According to a Bloomberg report earlier this year, Dish was said to be preparing to launch an online television service last summer. But, as we now know, nothing ever came from that -- at least not until today. The satellite company has taken to CES 2015 to reveal Sling TV, its long-rumored internet TV service, and it wants all current and would-be cord-cutters to know that this is designed specifically for them. Dish says that Sling TV has been years in the making, pointing out that it was born out of learning from Dish Anywhere and DishWorld, a US-only, internet-based TV package that offers access to about 200 international channels. "We started with technology on the Dish Anywhere service and building a platform for connected devices," Roger Lynch, who's been appointed by Dish as Sling TV's CEO, said. "Two years ago we decided we wanted to establish an entire separate service." What came from that first was DishWorld and, now, Sling TV, with the former expected to be integrated into the latter under the moniker Sling International. Similar to DishWorld, Sling TV will only be available in the US, where it's expected to launch "within the next month." The good news is that Sling TV has managed to secure a myriad of big-name channels as part of its over-the-top service, including ESPN, ESPN2, CNN, TBS, TNT, Cartoon Network, Adult Swim, Travel Channel, Food Network, ABC Family, HGTV, Disney Channel and Maker -- all of which are going to be part of the basic, $20-per-month package. Furthermore, Lynch added that at some point in the near future, there will be add-on, content-specific packages, featuring networks like Disney Junior, Disney XD, HLD, DIY, Cooking Channel and Bloomberg -- Sling International channels too, but those are going to be narrowed down by the country they are from. Better yet, you'll be able to enjoy Sling TV on a ton of different devices from day one, including iOS, Android, Amazon's Fire TV and Fire TV Stick, Nexus Player, Xbox One, Rokus and LG and Samsung smart TVs, as well as on the web on Mac and PC. During my brief time with it, Sling TV worked perfectly. The demo given to us was using a Roku 3 and an iPad Air, and it's obvious that Dish wanted the UI (see: lead image) of its internet TV to follow the same design guidelines across devices, regardless of the platform. The Mini Guide displays what's "On Now" on the different networks, letting you pick whether to "Watch Now" or "Start Over," both features being self-explanatory, although "Start Over" does depend on the content rights for each network. You can also do what Sling TV is calling "Network View," which allows you to see all the programming available from the networks, including on-demand content. But that's not it: Sling TV is going to have a built-in movie-rental service as well, just like you see nowadays on nearly every set-top box from cable and satellite outfits. For now, Sling TV accounts will be limited to one stream at a time, and the company had no comment when we asked whether there would be an option for simultaneous streams per account. Lynch told us that the focus right now is on the launch, plus making sure people understand that the service comes without any contractual attachments. "You have the option to have it for as long as you want," he said. Dish was also rather adamant about emphasizing that Sling TV is its own thing, which is why Lynch says that the service doesn't have any Dish branding. Still, it's hard to not think about things like the company's Hopper with Sling, a set-top box that's part of the Dish Anywhere ecosystem. Either way, chances are most people will only focus on the product's overall functionality, rather than the name of it. And right now, it's looking pretty good. 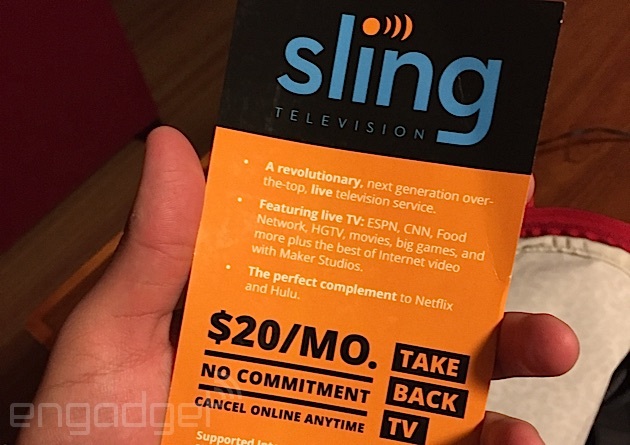 If you haven't already cut the cord, is Dish's new Sling TV service enough to make you do so?